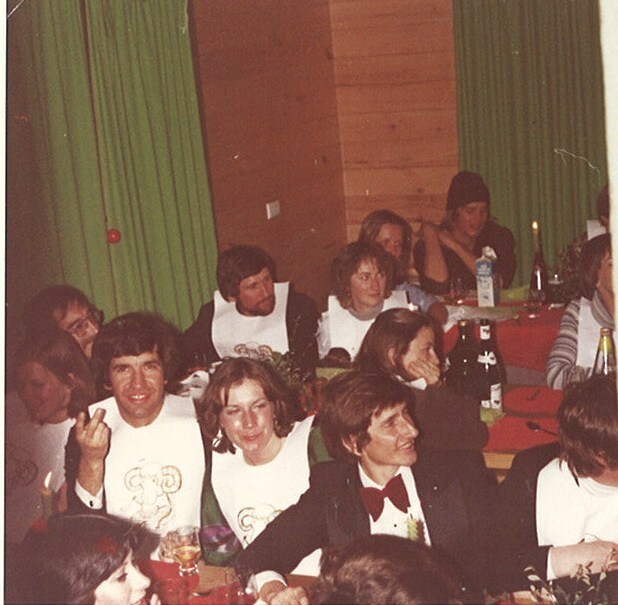 In August 1972, a group of fresh-faced Melbourne University chemical engineering students had just completed their final year exams and took up an offer from one of their number to have a week of skiing at Falls Creek, staying at the lodge, where he was a member. As one member remembers it, some of the guys were sitting in the lounge making various comments like "This is great", "Did they build it themselves?" and "We could do this!" One of the group remarked "OK then - let's do it!" Well it was probably after a hard day’s skiing and an even harder night’s drinking and, as they say, it sounded like a good idea at the time. Fourteen from the class of around 30 final year chemical engineering students were to form the core of the new club. Imbued with the enthusiasm of youth, work started on identifying a suitable location to build a ski lodge. 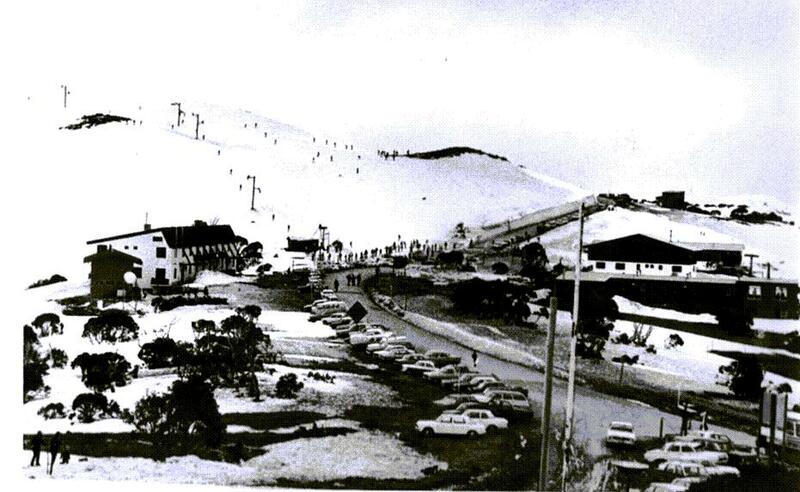 Sites were hard to get at Falls Creek but it was known that leases were available at Mt Hotham. 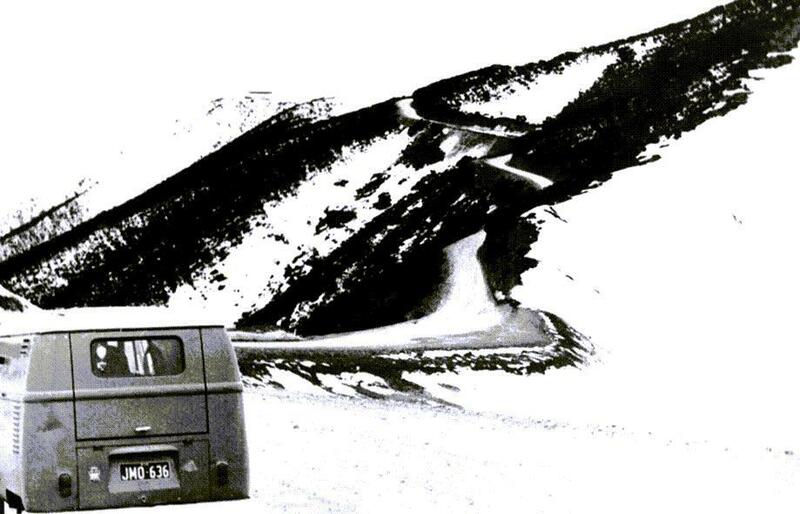 Before the August holidays were over, three of the future members took their trusty VW Combivan and made the trek up to Hotham to identify a suitable location. The road up the mountain was unsealed and, where they paused at Blowhard Cap to take this historic picture, there was no Armourguard railing and just a sheer drop on both sides. 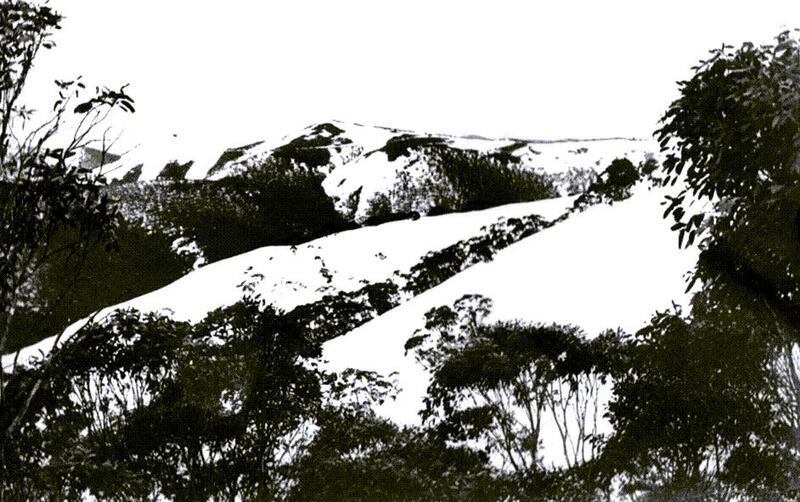 When they arrived at Hotham Heights, the view was very different from what you would see there today, although the Snowbird and Zirky’s (much smaller than today) were there, as was the Summit poma. Over to the right was the top of the Village double chair and in the distance the Brockhoff poma. Behind him and halfway up Mt Higginbotham was the old Hotham Heights Hotel, which was to suffer a sad demise by the time this short history is over. 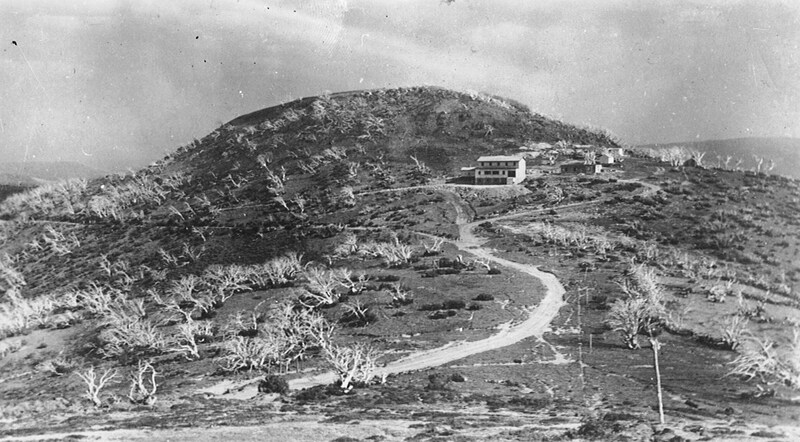 When the lads reached the Davenport area, they saw the Hotham Heights General store, followed by club lodges Karnulurra and Tantani. After that was the vacant Site 4. They reported that this site “had the advantages of location of tows and parking general access” – as well as magnificent view across the valley. On the other hand, the site, perched on the side of the hill, “presented some significant problems for construction”. The second site (now Kalnya), two spots along had “the advantage of being flatter and less densely treed” (and of course no where near as much fun for a group of raw amateurs to build a 42 square ski lodge). Following the historic first visit to Mt Hotham, a meeting of interested people was held on 4th October. A steering committee was appointed by those present “to carry on the interests until actual formation, and appointment of an official committee.” The main work for the steering committee was identified as being to apply for a site, recruit members, set an agenda for the first general meeting of the club and draft the constitution. Preliminary plans for 20-bed lodge were, as the inaugural meeting minutes report, “presented, discussed and accepted”. For a design which has stood the test of time and been highly complimented by many visitors, it seems that the members were happy to put their faith in the architect. 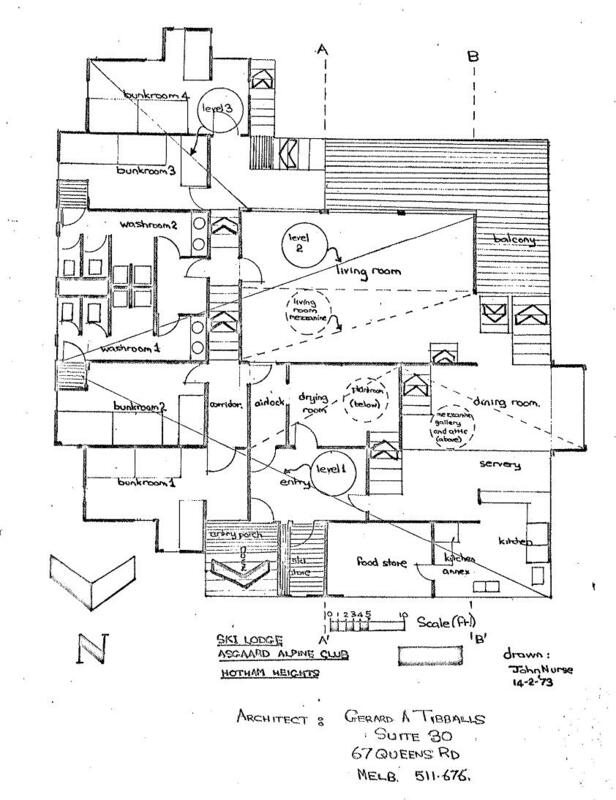 Gerry was granted a “free’ membership for preparing the plans and working drawings. The design included 4 bunkrooms (the present rooms 1, 2, 5 & 6) plus two wash-rooms (the present rooms 3 & 4). Whilst the bedroom accommodation has changed significantly over the years, it can be seen that the lay-out of the main living areas, with their magnificent views across the valley and to Davenport, has stayed virtually unchanged since the original 1972 design. The first Annual General Meeting was held on 30th November 1972, by which time the club had 31 financial members and another 12 interested in joining. The meeting voted to select Asgard as the club name. As recorded in the report of the AGM, “According to Scandinavian mythology, the terrestrial gods lived in a palace on a mountain top above the perpetual snow line. Access to this palace was by means of a by-frost, a rainbow bridge guarded by monsters and creatures of description we can leave to your imagination. The palace was called Asgard.” Within the next months, the club’s name had mysteriously morphed to Asgaard, the extra “a” being considered to make it look “more authentic”. At the July Annual General Meeting, the now famous Asgaard lion (reflecting the legend of a land protected monsters and strange creatures) was selected as the club emblem. Work kicked off on 7th April 1973, with the “Asgaard Alpine Developments beautiful blue and yellow builder’s shed” taking pride of place on the site. 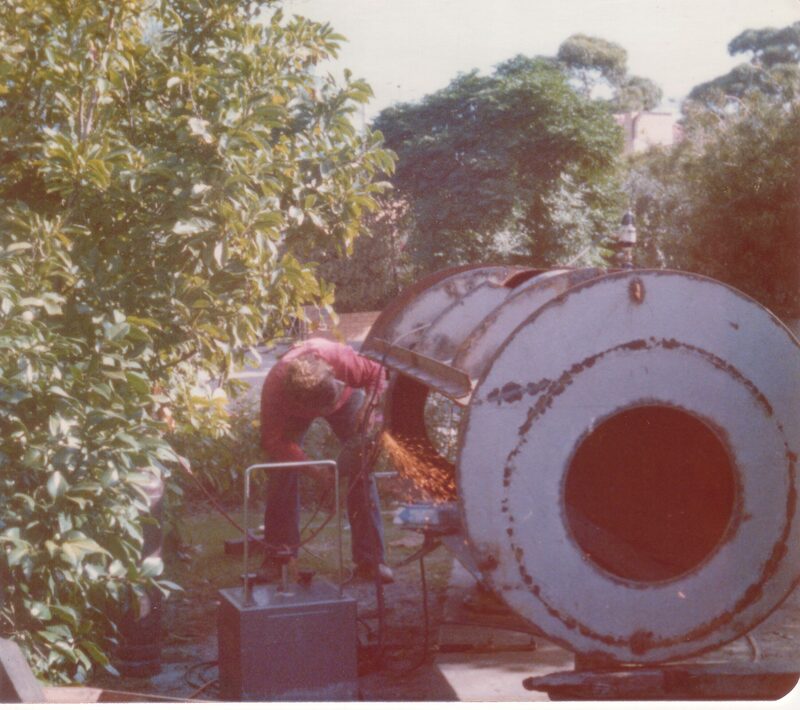 By early May, the excavation had been completed, plant room and wood-store slabs laid and concrete pads poured. It was decided not to put in the stumps, joists and bearers because of “the difficulty of obtaining the wood and secondly because the wood may become warped … if left over the winter.” Work had been planned to start at the beginning of October 1973, immediately after the snows had cleared. By that time, however, it became apparent that delivery of flooring and framing timbers would be substantially delayed; effectively preventing site works from getting underway. 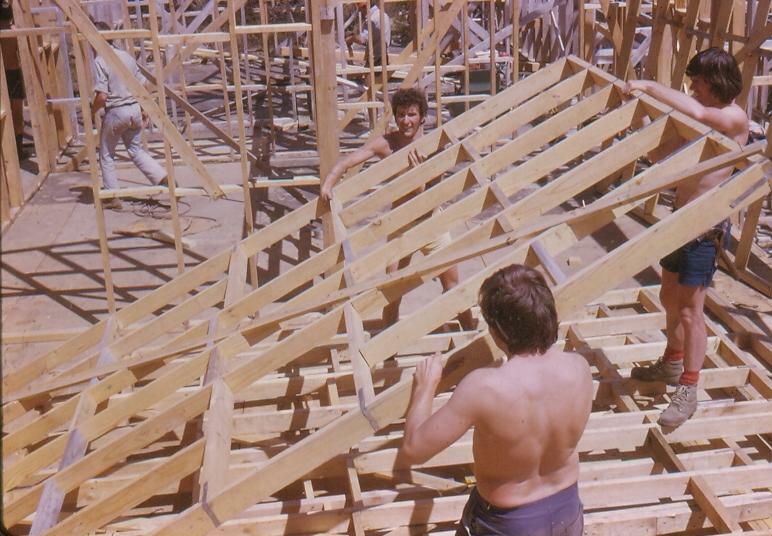 In the end, framing work didn’t start until March 1974. With the building season greatly shortened, there was a concerted effort to bring the lodge to lock up stage by the time the snow arrived. This extended, on some occasions, to working under flood-lights. But to no avail. 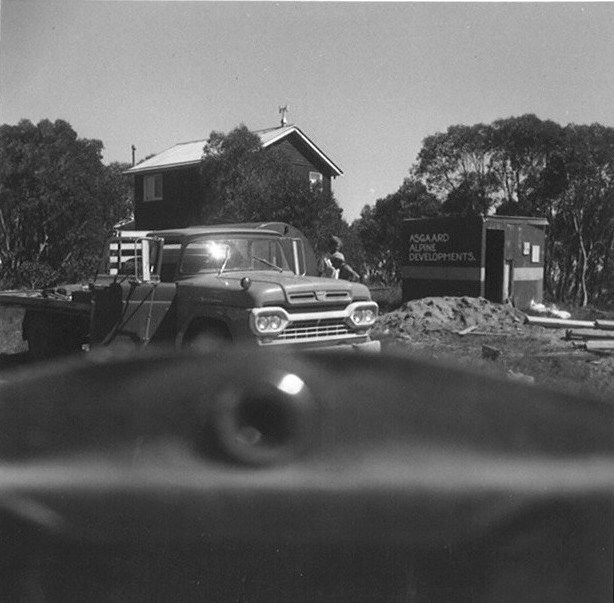 In May 1974, during a severe storm at Hotham several wall frames fell down and were damaged, resulting in a demand from the Shire Engineer that building works be suspended. When Spring arrived, work could finally get underway. The corrective work to the frames and supports had been completed to the satisfaction of the Shire Engineer and work could now proceed on the roof installation and the cladding. As reported in the newsletter “Well, the Asgaard Opera House (so named for its striking design rather than any other similarities) continues to take (its rather unique) shape. It certainly is destined to be one of the most impressive lodges on the mountain. 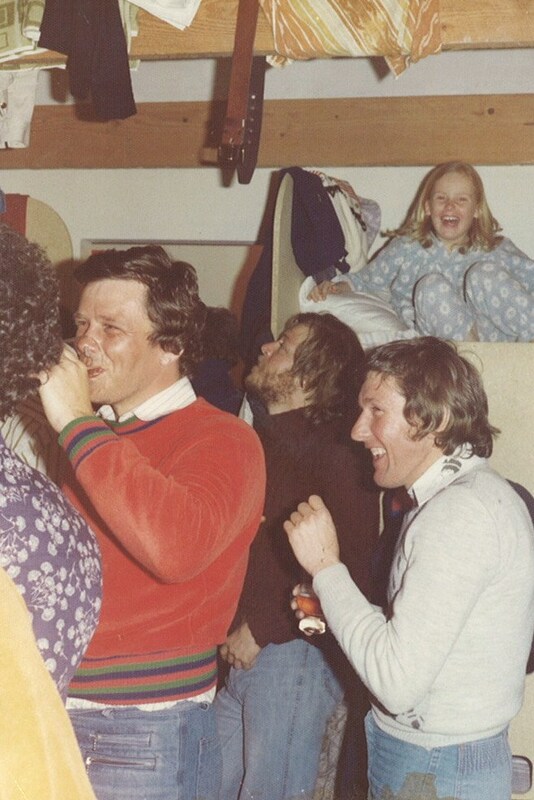 The Queen’s Birthday weekend, in June1976 saw the formal opening and christening of the lodge, but work continued (interspersed with a bit of skiing) through most of the season. The committee minutes note the excellently selected colour scheme for the curtains (green), lino (red with fleck) and carpet (charcoal). Somehow, the highlight of the interior design, the Pillar-box (or is that Fire Engine) red for the doors and feature walls didn’t rate a mention! Late on the Wednesday night of The Weak, members and guests were dragged from their beds to attend an important activity in the lounge room. As reported in the visitors’ book “Court proceedings were held to determine the guilty party involved in putting snow in random beds. After 3 hrs, 1 packet Salada, 1 kg cheese an, 3 bottles of port and multitude of beers the short-list was narrowed down to 9 members and all of the members of McMillan. Due to the condition of the hanging judge and jury consisting of drunks chosen at random, the case was left unsolved – but the question will always be with us.” In the end, the crime was put down to the ubiquitous Yeti, which has now become part of the club’s history. The visitors’ book for the Thursday of The Weak reports that one member “nearly joins the Hotham Swimming Club; on the bottom of the chair when he slid down under the pylons to the creek. 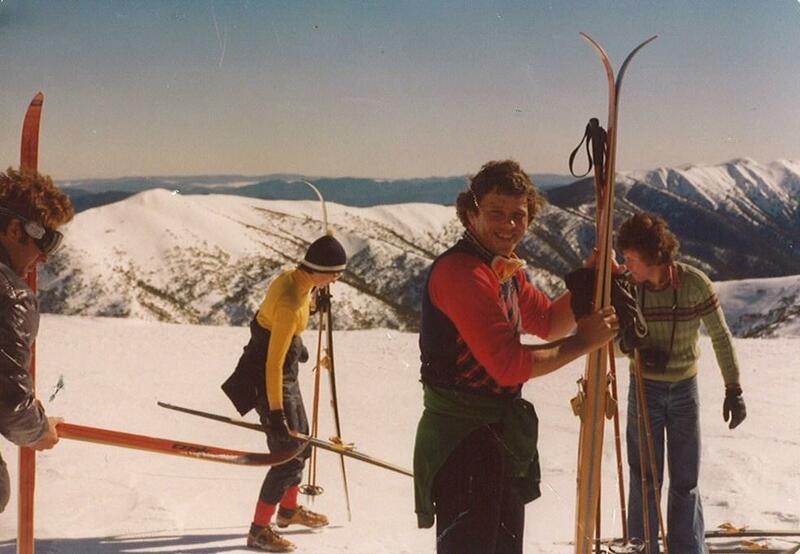 Awarded 9/10 by the tow operator.” The Asgaard Swimming Club (as it came to be called) became a popular affiliation during this period, especially at Snake Gully where skiers returning from what is now the Brockhoff runs had to negotiate a narrow and perilous path with tree roots looping up through the snow. One false move and you ended up in the creek below. If you managed to get out – and not everyone did - you could look forward to a long and cold trip back to the lodge. The last work, including “sow grass seed and lay straw around the lodge” was (finally) completed in time for the Official Grand Opening on Queen’s Birthday 1977. From the first ideas of forming a club and building a lodge it had taken nearly five years, over 30,000 manhours of (often not so efficient) labour, countless workparties in sun, rail hail, sleet and even under floodlight, countless banged thumbs, skinned knees and horrendous hangovers as well as many great times and the forming of lifelong friendships. All involved were glad to have survived the trip and celebrated – as one would expect – most enthusiastically. The weekend was fully catered (for the very reasonable sum of $30/head) with Christmas dinner (formal or fancy dress required) on Saturday night, a champagne brunch on the Sunday, followed by a movie night (Jaffas not supplied). It had been a long, hard journey, with many twists and turns. According to the newsletter “Sunday lunchtime the crew got the taste for 4 dozen bottles of champagne. That took care of Sunday afternoon. Six-a-team boat races with champagne is a novel variation on that old drinking game. There were some funny scenes.” One can just imagine.